As Curiosity – NASA’s intrepid Mars rover – made its historic descent into the atmosphere of the Red Planet August 2012, the millions of earthlings watching the live feed at home seemed to have just one question: Who’s the guy with the mohawk hairdo? The young man garnering the attention was Bobak Ferdowsi, a flight director at NASA’s Jet Propulsion Laboratory, whose mohawk of red and blue (with yellow stars dyed in the sides of his head) definitely stood out as he coolly went about his duties in JPL’s busy mission control center. So much in fact, even President Obama had to comment. 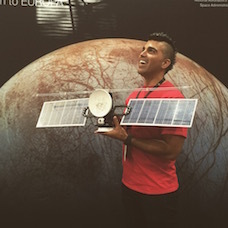 Even before his new-found fame as “Mohawk Guy”, Bobak was known among colleagues for his habit of sporting a new hairdo for each phase of the rover mission – just to lighten the mood in the control room. From the reaction of the public to his mohawk, one has to agree that people for the most part liked what they saw. You could say his ultra-mod look goes a long way in humanizing scientists as “cool” and real people, and could possibly help inspire kids in space exploration and careers with NASA. Born in Philadelphia, PA, Bobak is of Persian descent; his father is from Iran, and his mother was born and raised in the U.S. Soon after birth, he moved to the San Francisco Bay Area where he stayed until age 11. He then moved to Tokyo in 1991, where he attended the American School in Japan, graduating in 1997. The same year, he enrolled at the University of Washington where he majored in aerospace engineering, a childhood dream. While there, he did research under Nobel Laureate Hans Dehmelt in the Department of Physics. In 2001, he enrolled at the Massachusetts Institute of Technology (MIT) and joined the Lean Aerospace Initiative where he stayed until 2003 when he joined NASA. Since becoming an iconic image of the Curiosity landing with his mohawk, he has also become something of a media sensation, or an instant “meme,” especially on social networks.